One change in the beauty industry I have noticed over the last few years is the emphasis on vegan and cruelty free products. 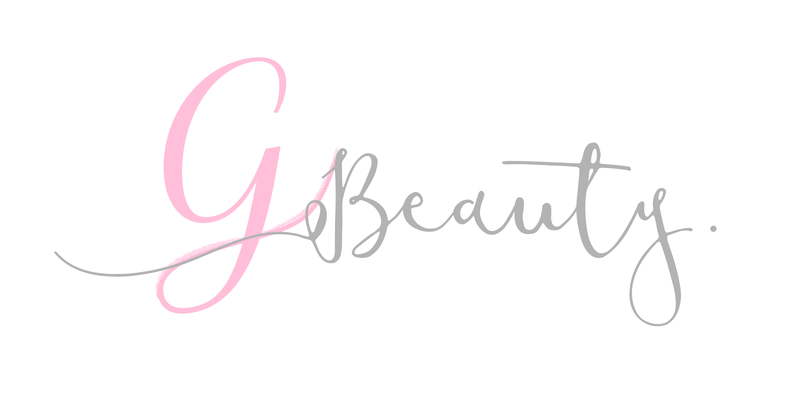 Although I am not a full convert, I have been trying to incorporate it into my beauty regime more and have become increasingly aware of the products I am using. An important part of your beauty regime is your skincare. Our makeup looks much better if we have smooth skin underneath! Although eating well and drinking plenty of water is essential for great skin, we do have the added benefit of being able to use skincare products. And let's be honest, vegan products are probably much better for our skin than non-vegan! This is where Bravura London comes in! I have been following the brand for quite some while and using the products a lot recently. The company was set up in 2003 by Amanda, a fellow welshwoman! Since then, the company has gone from strength to strength and has seen the likes of Ed Sheeran using their products. As I have combination skin, I was given the First Cleanse Oil, the Revitalising Ginseng Toner and the Azulene Moisturiser to use as my daily skincare. I was really interested in the chemical peels and I was lucky enough to be sent the Lactic Acid and the Salicylic Acid to test out as well! Minus the somewhat questionable diet, I have always taken good care of my skin. I have been using the Clinique 3 step skincare range for years and it has always worked for me. But as you probably know, Clinique under the parent company of Estée Lauder, is not cruelty free. The three products do work in a similar way, so using the Bravura products didn't change my skincare routine much. First up is the cleansing oil. This can be used as a cleanser but it does also double up as a makeup remover. The formula is quite thin, which makes it really easy for applying onto the skin. I just press the pump (which you do have to get separately) and distribute it evenly across my face with my fingers. It hardly takes any time at all! You can wash it off with just water or you can use a muslin cloth or flannel. I prefer using muslin cloths myself! It is really gentle on the skin and has quite a neutral scent with a hint of lavender. 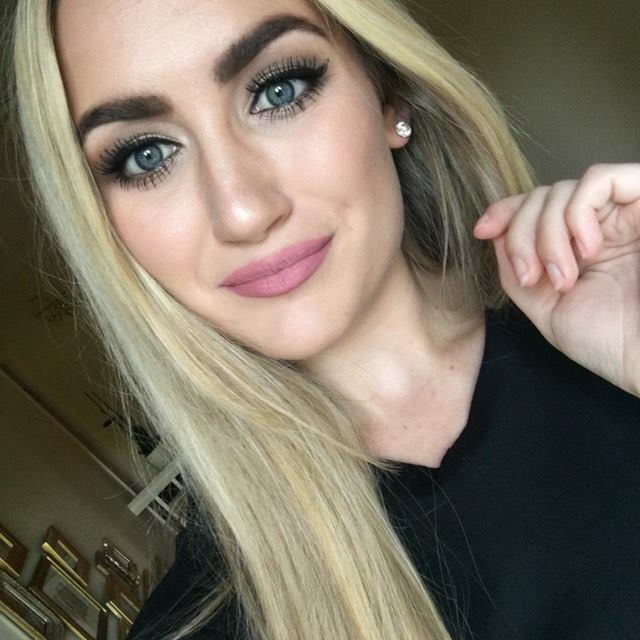 I found that it took off my makeup really quickly and easily, including my eye makeup! It did struggle a little bit with my lash glue, but I think that's just because I wear some pretty heavy duty stuff. This toner is again very gentle on the skin, something I have found to be very true of all of the products! I pop this onto a cotton pad and rub all over my face. It removes any of the excess dirt and really gets into my pores. It doesn't sting the face and has a very pleasant smell. After cleansing and toning, my skin is in definite need of some moisture! I love the blue and rose gold design of this little pot, so beautiful. The moisturiser is actually blue as well! Much excitement. The formula is neither thick nor thin, it's just right. It rubs in really easily and you don't need much at all, a little goes a long way. I love the feel on my skin, it feels really silky and feels light on the skin. It doesn't have a particular smell, although it does remind me of being holiday. Although I really like the skincare range, it is the acids that have really captured my heart. There are three in the range and I have been testing out two of them. I have the Salicylic Acid (£9.59) which is aimed at combatting blackheads and open pores and the Lactic Acid (£9.59) which combats hyper-pigmentation, acne and dry skin! The Lactic Acid is also infused with rose water, it smells so pretty. 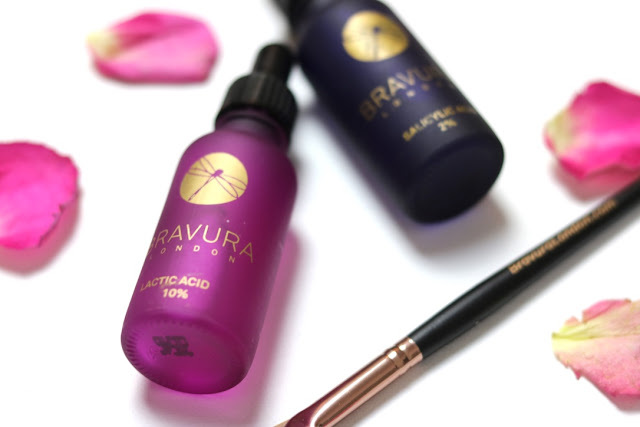 These acids work as at home chemical peels. Their acid content is not as strong as you would get in a salon, but they work really effectively. The two 30ml bottles come with pipettes incorporated into the lids, making them very easy to use. 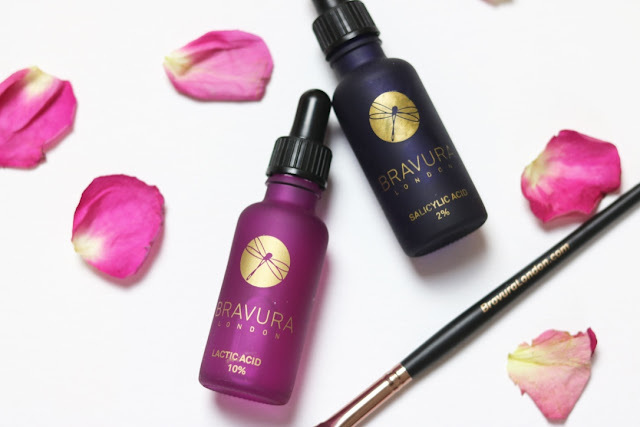 When I first got them, I used to pop a couple of drops into a little ceramic pot and then use the Bravura brush to sweep it over my face. As I like to cut corners, I have now started popping drops straight onto the brush and then sweeping it all over my face. Both ways work equally well! I have been using the two acids in conjunction, so I couldn't tell you if one was better than the other. I have been using them on Mondays, Wednesdays and Fridays - alternating between the two acids on each day. It is advised to use them for 5-15 minutes, beginning with 5 minutes when you first start using the products and increasing the time as your skin adjusts to the product. I have to admit, I don't tend to time myself doing this. Naughty blogger. I tend to apply it and do some other things in the bathroom before washing it off in the shower. They don't burn at all on the skin, as I thought they would. It doesn't even feel as though there is anything on my skin at all! I just rinse it off with warm water and my work is done. Easy. As they work as exfoliators, I make sure to cleanse, tone and moisturise afterwards otherwise my skin would be a tad dry! My skin looks instantly clearer and my pores look much smaller. My skin even has a bit more of a glow to it than before! I definitely recommend doing it regularly, the more you use them - the more your skin improves. I dip in and out of using these acids, but when I do use them - I notice a massive change in my skin. If I get a breakout, I instantly get onto my acids and my skin clears up in no time! 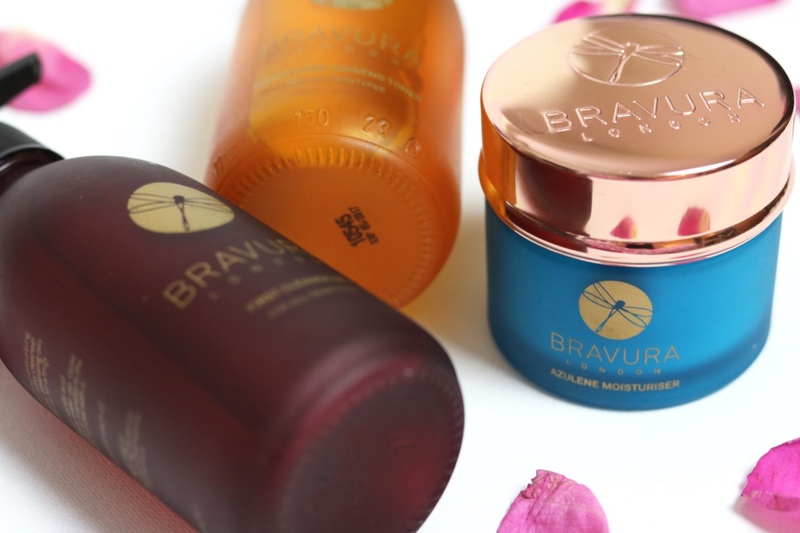 I have actually used these products with both my Clinique skincare and Bravura skincare routine. 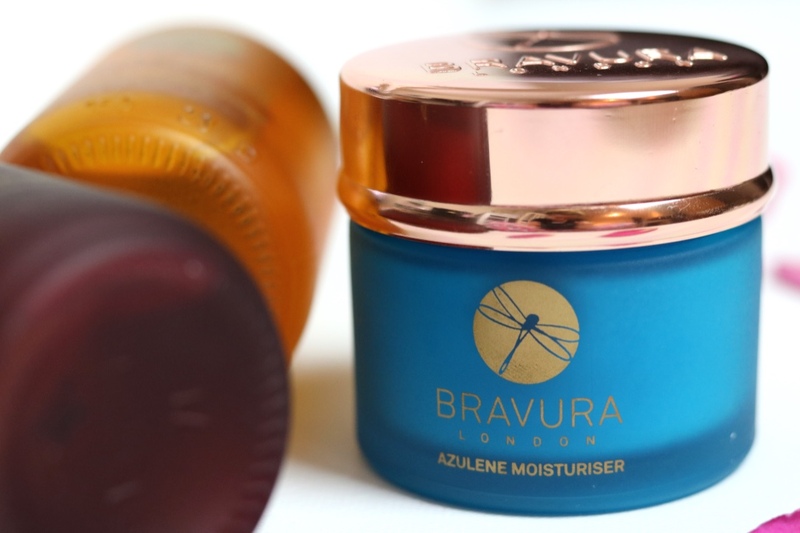 Both of which gave me the same effect, showing me that the products work independently of the Bravura skincare range and are good in their own right. 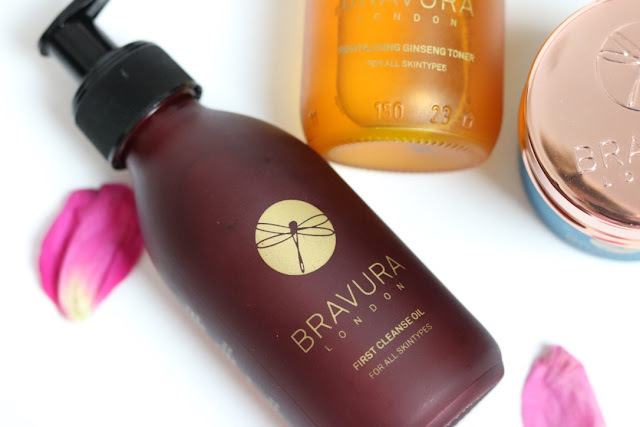 That concludes my review of the Bravura London skincare products! I have really enjoyed testing them out and dipping my toes into the world of vegan skincare. The products are all reasonably priced and definitely worth the squids! The glass packaging gives them a really expensive feel and they look really pretty in my bathroom. I will definitely be sad when they end, especially my favourite acids! Thank you for reading! 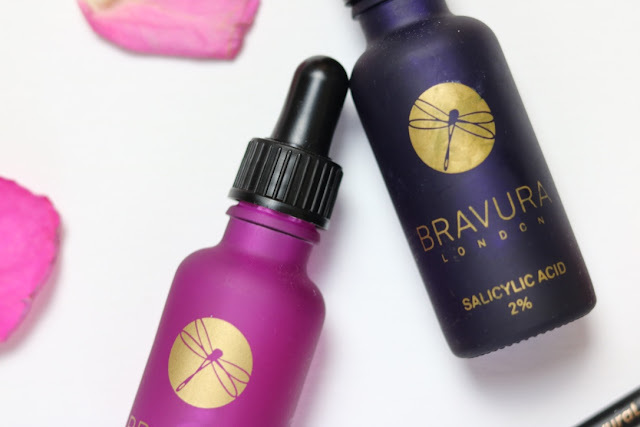 Let me know if you have used any Bravura London products in the past!